Sunless Spray Tanning from Mystic Tan and VersaSpa | Palm Beach Tan to improve your experience. With sunless spray tanning, you get natural-looking results perfectly matched to your skin tone with just one visit. It’s important to note: a sunless spray tan is a completely cosmetic tan and does not provide protection from the sun’s rays. 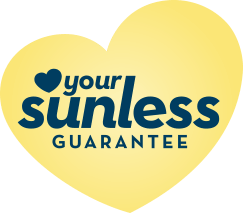 At Palm Beach Tan, we’re proud to feature only authentic tanning sprays from Mystic Tan, VersaSpa and VersaPro; that’s why it’s easy for us to offer this simple guarantee. If you don’t LUV your spray tan from Palm Beach Tan, it’s on us. Visit your local salon for details.